Romantic hideaway or city escape, both are welcome here. Artists and photographers will be heaven with the magical scenery. Take a packed lunch from the restaurant, and make a day of it. In the thick bamboo forest or around the property, both promise to be a quiet and enjoyable stroll. Request for one of the hand-drawn maps and explore the local area. 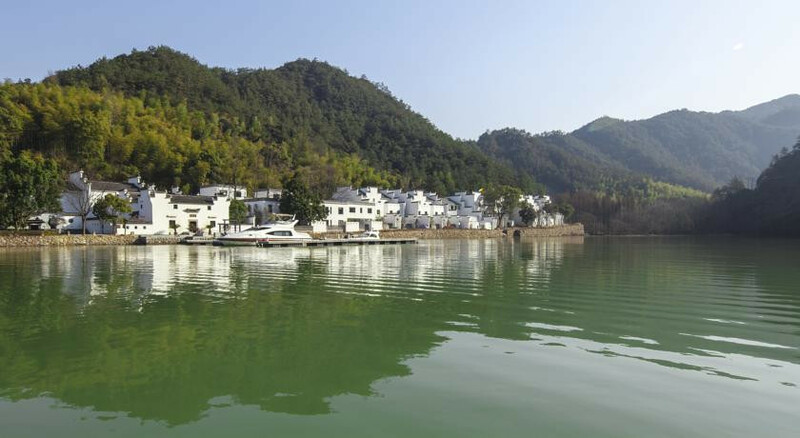 Fuchun, Xinan and Xu Rivers offers miles of kayaking opportunities. Fuchun Kosa is located in Fuchun River National Forest Park. It is separated from the outside by Fuchun River and it is surrounded by the mountain and river. Boat is the only vehicle. People can live a very quiet and comfortable life in our hotel. The air is very fresh, water is very clean and the whole scenery is very beautiful. Guests can kayak, go fishing and ride or hike to the mountain. And they also can write Prajnaparamita Heart Sutra (a very classic Buddhist sutra) in Fuchun College (a Song Dynasty style building). During the summer, guests can swim in the outside swimming pool (spring water). Fuchun Kosa also offers several kinds of tea and coffee for free, guests can sit down to enjoy those tea and coffee in Li Hall. Chinese breakfast: porridge, beanmilk, egg, dishes and steamed buns. We can also offer lunch and dinner, but they are not included in the room price. The three-room and four-room villa are more popular room type because they are suitable for a group of guests (6-8 pax), they can use their room independently and share a dining room for chatting and drinking tea together. We have MTB and kayak for children. Some of our rooms can put extra beds.